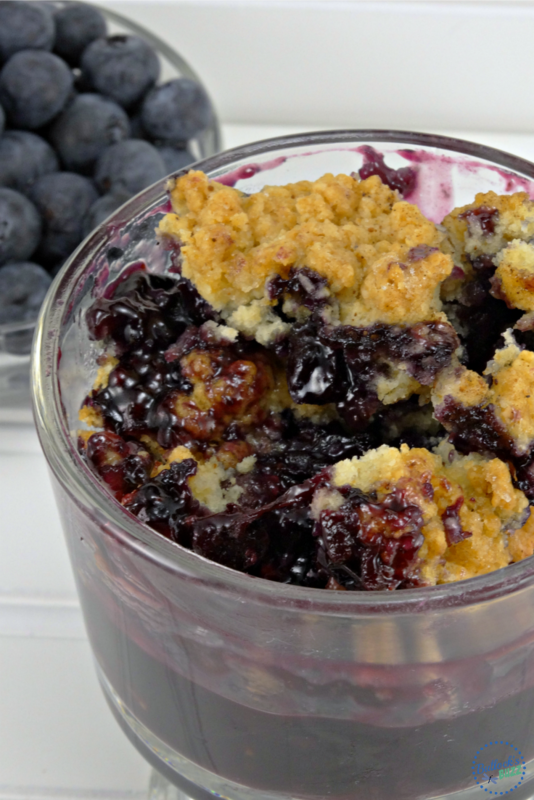 Fresh blueberries are lightly sweetened and spiced, covered with a flaky nutmeg- and-sugar dusted topping, and then cooked to perfection in this mouth-watering Blueberry Cobbler recipe. As soon as the weather gets warmer, I start to crave fresh fruit. Luckily, living in Alabama, I have easy access to all kinds of fresh fruit and seafood directly from Florida! So far this season I’ve made these amazing Mini Blueberry Pies, as well as my family’s favorite Caramel and Nut Dipped Strawberry treats! And each recipe was made using fresh fruit. Loosely based on two different cobbler recipes – one I found years ago in a magazine, and the other a friend shared – this is truly the best homemade cobbler I’ve ever had! It’s also the perfect dessert for a family cookout or picnic. 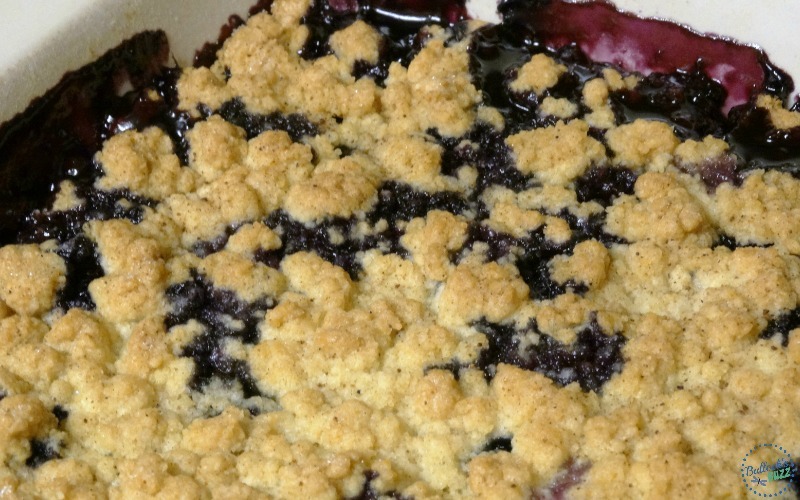 And the fresh blueberries make this fruit cobbler too delicious to pass up. 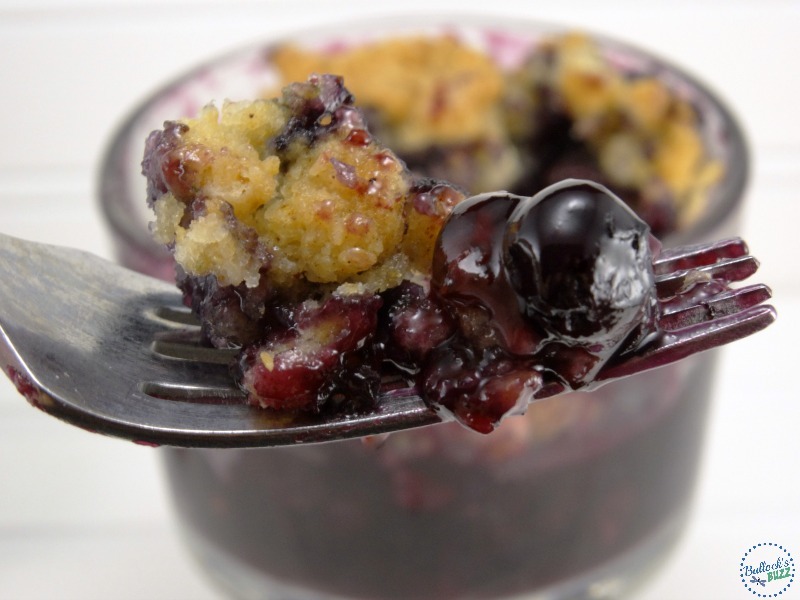 Ready to see how to make this amazing Blueberry Cobbler? 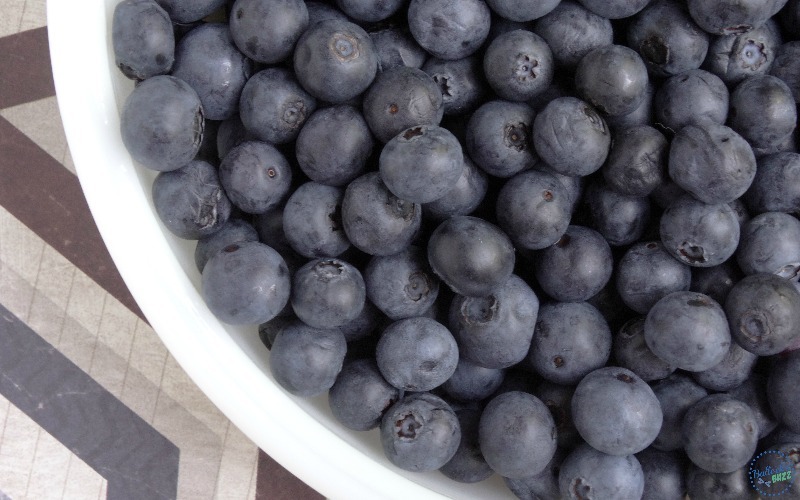 Begin by placing the blueberries into the prepared baking dish. 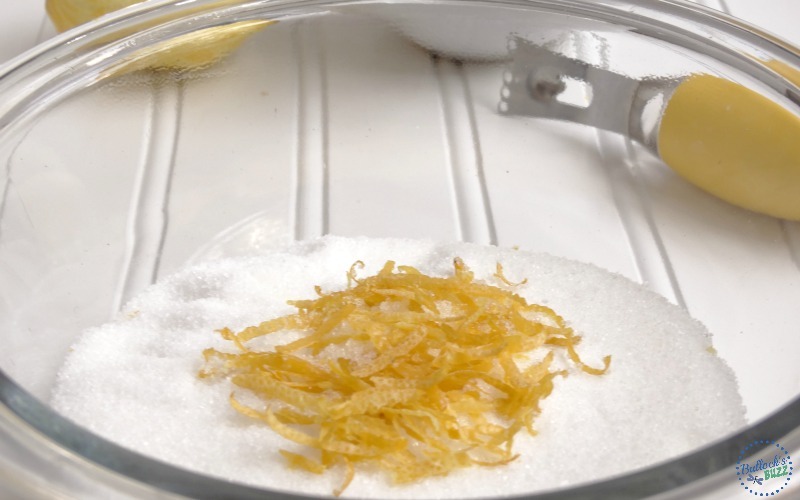 In a small bowl, combine the cup of sugar and lemon zest. Tip: work the zest into the sugar with your fingers. This will release all of those yummy essential oils and give you the maximum flavor! Now add the flour and whisk until thoroughly combined. Next, sprinkle this mixture evenly over the berries in the prepared baking dish and toss gently. Make sure the mixture is evenly distributed over the fruit. You don’t want any mounding in any one place. Now set the mixture to the side. – In a medium bowl, combine the flour, 6 tbsps. sugar, baking powder and salt with a whisk until well combined. – Next, using a pastry blender, two knives, or a food processor, cut the butter into the flour mixture until it resembles a coarse meal with pea-sized pieces of butter. – Now, in a small bowl, whisk the vanilla into the lightly beaten egg using a fork. With the fork, slowly add the beaten egg and vanilla to flour mixture until moistened and a dough starts to form. – Continue tossing and blending gently with your fingertips until it is well combined. Take care not to overwork the dough! 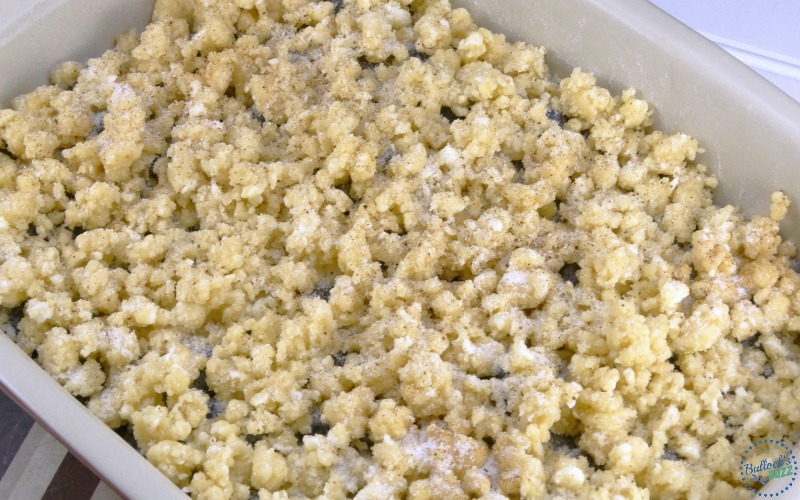 You want the dough to look like crumbles – see the picture below. Tip: if the dough is still too powdery, add a little more egg (not a whole one though). Now sprinkle the crumble topping evenly over the blueberries. Follow this with a sprinkling of sugar (from the remaining 1/2 tbsp) and grated nutmeg for some extra YUM! Bake in the preheated oven until the topping is golden brown and the filling is cooked all the way through. This usually takes about 40 to 45 minutes. Tip: prevent over-browning of topping by cover with a sheet of aluminum foil after 25 minutes of baking. Once it is done baking, remove the foil and place it on a wire rack to cool. 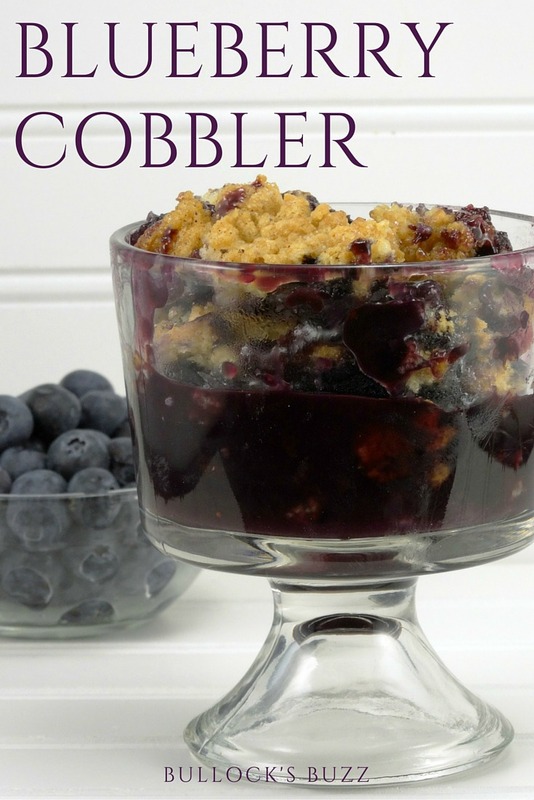 Serve the blueberry cobbler warm with a scoop of vanilla ice cream or with fresh whipped cream! And enjoy! Doesn’t it look amazing? Don’t forget, the handy-dandy printable version of this blueberry cobbler recipe can be found at the end of the post. Place an oven rack in lower third of the oven and preheat the oven to 375ºF. Lightly butter a round quiche or pie plate (10 inch) or a 2 or 2.5 quart baking dish. Place blueberries into the prepared baking dish. In a small bowl, combine the sugar and lemon zest. Add the flour and whisk until thoroughly combined. 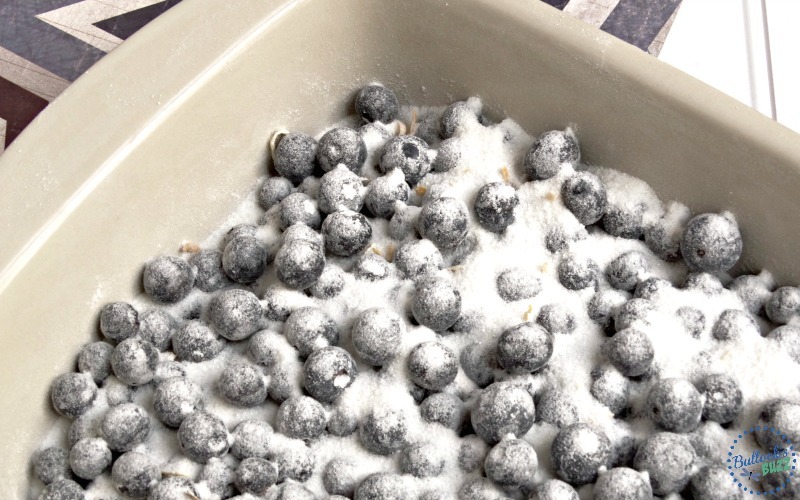 Sprinkle this mixture evenly over the blueberries in the prepared baking dish and toss gently. Set the mixture to the side. In a medium bowl, combine the flour, the 6 tbsps. of sugar, baking powder and salt with a whisk until well mixed. Using a pastry blender, two knives, or a food processor, cut the butter into the flour mixture until it resembles a coarse meal with pea-sized pieces of butter. In a small bowl, whisk the vanilla into the lightly beaten egg using a fork. With the fork, slowly add the beaten egg and vanilla to flour mixture until moistened and a dough starts to form. Use your fingertips to toss and blend gently until well combined. Do not overwork the dough. It should look like crumbles. If the dough is still too powdery, add a little more egg. Sprinkle the crumble topping evenly over the blueberries, followed by a sprinkle of sugar from the remaining 1/2 tbsp., and grated nutmeg. Bake in the preheated oven for about 40 to 45 minutes, or until the topping is golden brown and the filling is cooked all the way through. About 25 minutes into baking, cover with a sheet of aluminum foil to prevent over-browning. Once done, remove foil and place cobbler on a wire rack to cool. Serve warm with a scoop of vanilla ice cream or fresh whipped cream. As I’ve mentioned before, Fresh From Florida and the Florida Department of Agriculture are working together to promote locally grown Florida produce and fresh seafood. Fresh From Florida fruits, vegetables and seafood are harvested at the peak of the season, which means better tasting and more nutritious foods for your family to enjoy. From local farms to our kitchen tables, Fresh From Florida and the Florida Department of Agriculture guarantees fresh and delicious food that makes every recipe a family approved win! The next time you are in the store, make sure you look for fresh fruit and seafood from Florida. All you have to do is keep an eye out for the Fresh from Florida sticker. You won’t regret it. Not only does it taste wonderful, it’s good for you too. You can always find out what’s in season by checking out the Fresh From Florida website. While you are there, be sure to browse through their selection of amazing recipes featuring Fresh From Florida produce and seafood! What are some of your family’s favorite fresh fruit or seafood recipes?